Since St. Patricks day was celebrated last week, I thought it was about time to write something about my visit to Dublin. St. Patrick’s Day is a bank holiday on which Ireland’s most important saint is commemorated. You can find many parties where people dress up in green or dress up with other Irish symbols. This day is celebrated worldwide, but the best location to celebrate this bank holiday will be definitely Dublin! 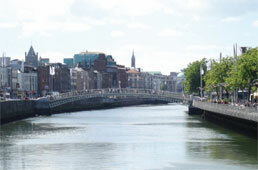 I went to Dublin together with two friends, we all love to visit cultural sites during the day and explore the pub culture during the night, and this was exactly the reason why we decided to book a trip to Dublin. The first day we went to see Trinity College (http://www.tcd.ie/). This is the oldest University of Ireland, it looks absolutely stunning and typically Irish. You could see many students walking around, on their way to the lectures. The most interesting part of Trinity College was the library; I have never seen a library this large (and high!). I must admit that it felt like I just walked into the library of Hogwarts.